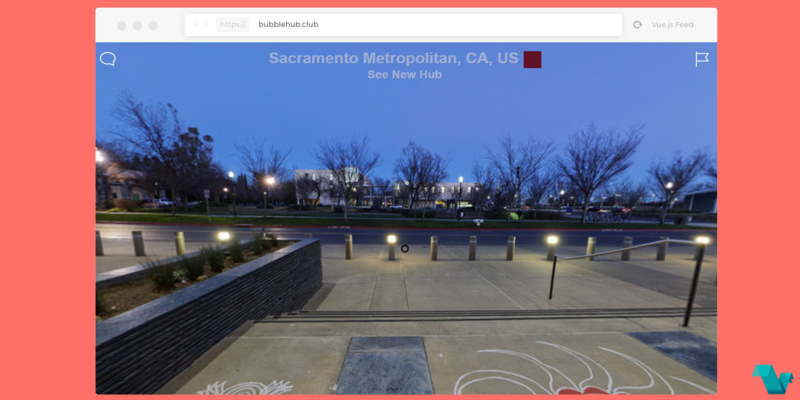 Bubble Hub is a VR location collector and real time chat built using AFrame, Vue.js and Google Firebase. In this VR collector, you are starting from a random location and then you have to focus & click on a colored paper plane to see a new Bubble. Alternatively, you can refresh the page to see a new Hub or click below the current location. When clicking the colored paper plane a message appears to inform you that you 've checked in, and then you get to a different place of the same city/location. Also, if you click on the bubble icon on the top-left, the real time chat page will appear, where all latest check-ins are listed, as well as messages. If you would like to explore more about Bubble Hub, head to the project's repository on GitHub, where you will also find the source code.